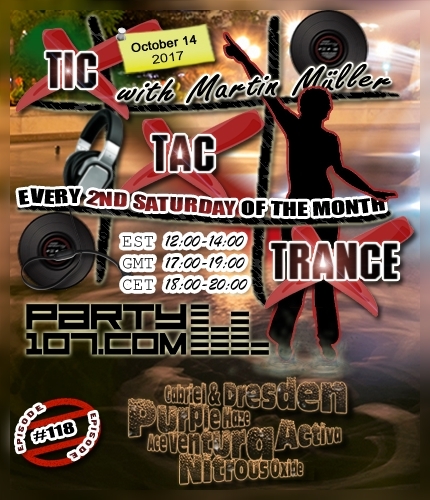 Tic Tac Trance #118 Replay available! Tic Tac Trance #118 is almost here! This episode will air on October 14 2017 on Party107.com and will feature new tunes and remixes by artists like Gabriel & Dresden, Purple Haze, Ace Ventura, Activa, Nitrous Oxide and, of course, many, many more! This time I’ve prepared an uplifting, progressive & psychedelic 2 hours underground trance journey. Make sure to tune in! Click HERE to join the event on Facebook! Live tracklist updates during air time HERE!